Jack holds a great Muskegon river steelhead from our outing the other day. 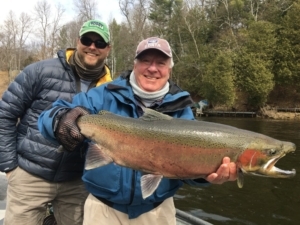 The Muskegon river fishing report for April 7, 2019 in the Newaygo, Michigan area is an update on the spring steelhead run, which had been delayed quite a bit due to ‘ol man winter sticking around a bit longer than normal this “spring” ! With some very cold nights even into the arrival of April, the reservoirs above Croton dam retained ice for longer than normal, but this has changed with warmer weather coming through the Midwest. Click HERE for current and forecasted weather. After heavy rains and snow melt-runoff in mid March, the river came up quite a bit and stayed high…and COLD….for nearly 2 weeks. River levels began to drop the last week of March, stayed quite cold during that time, but has begun to warm up a bit over the last week as river levels continue to drop. Click HERE for current Muskegon river water flow data. Spring steelhead are being found around spawning grounds, in “staging” pools and runs, as well as in “drop back” feeding lanes and lies as we’re into a full gambit of conditions during the spring run. Although we don’t have a lot of steelhead in the system, this can change quickly once river temperatures get above the 40 degree mark. With both fly fishing and light spin tackle equipment, we’re catching not only migratory steelhead, but also resident Brown and Rainbow trout. There has been some pretty impressive stone fly hatches going on the last few days and I even spotted some trout “looking up” and feeding on early spring dry flies ! Present water flows are in the 3,300 cfs range and hovering around 40 degrees.